Note: I have decided to stop using tippet rings within the construction of the leader. I am leaving this as is so if you wish to try the rings, you have this information. There are many configurations and "correct" versions of European nymphing leaders with many purists on the interwebs claiming to have the only true European method and thus, defend thier choices as the high priests of a fugitive religion. The simple fact is that not every leader rig will work for every situation. I have spent the better part of twenty years modifying and tweaking "Czech" leaders to suit my needs and trying every leader I can. I have built and used countless leaders from hand tied mono leaders to furled leaders to merely using long lengths of level monofilament. The leader rig I describe on this page has risen to the top of the heap to become my base leader of choice that I use on many rivers, fish, and anglers of all skill levels in my guiding business. I am not a purist in any sense of the word nor am I following Fips Mouche sanctioned events and rules. I want to have as many options as possible to choose from when I am out fishing. Fishing large western rivers such as the Colorado, Deschutes, Madison or Roaring Fork Rivers require a different set up than a traditional Czech or Polish rig can handle. I have found on these large western rivers, the French leader system to be the best option for fishing a tight line while still keeping direct contact with my flies at distances not easily obtained with Czech style leaders. When fishing smaller rivers, switching to a traditional Czech leader is a good option. There are no right or wrongs, simple methods that work better than others in any given situation; this is what tactical fly fishing is all about. A functional base leader is a hand made with the formula taken from Jonathan White's book French Nymphing the New Way. I like the "Slow Action Long-Range Indicator Leader" described on page 17 because I can make accurate long-range distance casts with it. I make a bicolored sighter that is greased with floatant for long range drifts where the base leader and sighter will float on the surface of the water. Allowing portions of the base leader to float is a feature of the French leader. Employing a tight (straight) line on the leader allows the angler to remain in contact with the fly while the sighter is incredibly sensitive providing amazing visual feedback. A sighter is an essential tool in this set up acting much like a bobber indicator where you may lose the feel of the take but still keep in visual contact. The sighter also indicates the location and depth of your fly so making manual adjustments to the drift almost becomes innate. Keep in mind that while fishing a French leader, you are still keeping a tight line on your presentation except that in long range situations, you have the leader and possibly fly line floating on the surface of the water. The line that remains on the water surface taxes a handicap on the tactile feel of the take. This handicap is overcome by a greased bicolored sighter so that a fish taking our nymph is seen just as often as it is felt. This opens up a broader swath of water that you can efficiently cover while employing a tightline technique. You can purchase my best sighters here. This leader is popular amongst the French competition anglers. tippet of length and weight of choice depending on depth. Soft nylon material is the preferred material for constructing French leaders. I use Maxima clear; however, to become supple and board-straight, this material requires being boiled in water for 5 minutes and pinned out straight along a wall to cure overnight. After boiling, it is easily straightened out if coil develops while being stored on your reel spool. I also dye my leaders. I use an orange and olive acid dye bath ( 1/4 cup vinegar to 2 cups water), dipping portions of the leader in each pot of dye, to color them a multi-tone camouflage. This leader and fly formula is the foundation for success in your tactical fishing endeavors. Not every river or situation calls for the same technique. Stay flexible and adapt to every scenario. If it's very windy, long leaders are not fun to fish. I will not hesitate to switch over to a classic 9' western nymph leader and a bubble style indicator with which I can punch through the wind and keep a tight line. If I am fishing a smaller river, I will switch to a traditional Czech leader not discussed here. 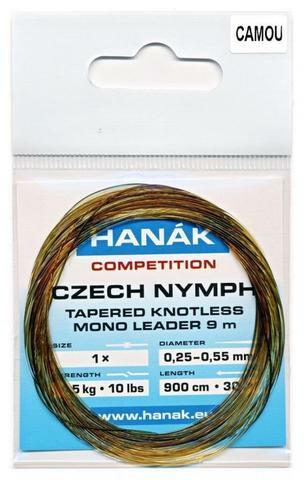 Note: I am now using Hanak and Hends competition leaders on all of my rods. I am using the 900cm or 30' camo colored leader on my 10' 3wt competition rods. This leader allows me to delicately deliver a size 20 jig with a 2mm bead accurately to my target. On my 10' rods which are heavier than the 3wts, I opt for the 450cm or 15' version attached directly to the fly line. The larger rods allow delivering heavy jigs and turning big fish in big water (Most guests use the 10' 5wt rods on guided trips). A 450cm Hanak Czech leader has enough taper and length for delivering dry flies at long distances with finesse. I found this leader used on my 10' 5wt rods also offer perfect still water coverage. Euro Sighter with integrated tippet rings. My favorite nymphing rigs now incorporate a 6" bi-colored sighters. Two-tone neon coloring and markings provide amazing visual feedback and tactile sensitivity in all fishing conditions. I have been using and testing this sighter for several seasons now. I am confident in my updated methods of construction and materials that you will now be receiving the highest quality product possible. I have shortened the length to a mere 6", an ideal length for almost every fishing situation I have encountered. I now make them more durable with a method of bonding that is both lightweight and flexible. I am very picky about the tippet rings. I have tested many tippet rings available and have now chosen a very select few that I trust will be strong and smooth keeping your finest tippet strong. I use these for long line french nymphing on larger rivers where distance, accuracy and sensitivity count. Dress the length of the sighter with floatant and they will float well during the upstream portion of the drift. I have been using these while guiding new fly anglers and have had many beginners start catching within the first 15 minutes on guided trips. More and more anglers and guides are choosing my sighters for thier tactical angling needs. Leader and sighter combo in action on a small private creek in Colorado.